Singapore's Anime Festival Asia 2009 has been announced for the 21st to the 22nd of November, in 2009 of all years. 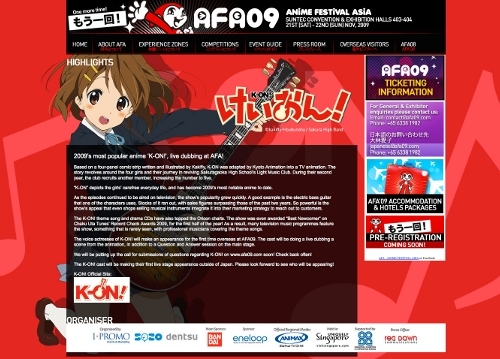 I guess it makes sense that it'd be in 2009 given the name is Anime Festival Asia 2009. Sometimes I worry that I could be too funny. I lie, I really never think that, and I'm sure you don't either. What's epic about this years one (aside from the fact I'll be back in Singapore at that time which means I could go this time!) is the seiyuus from K-On will be there answering questions and even doing a live dub!! What's more, my spell checker is telling me seiyuu should be spelt seizure. I guess that could be seen as an interpretation of an expected result of this. Anyone planning on going this year?